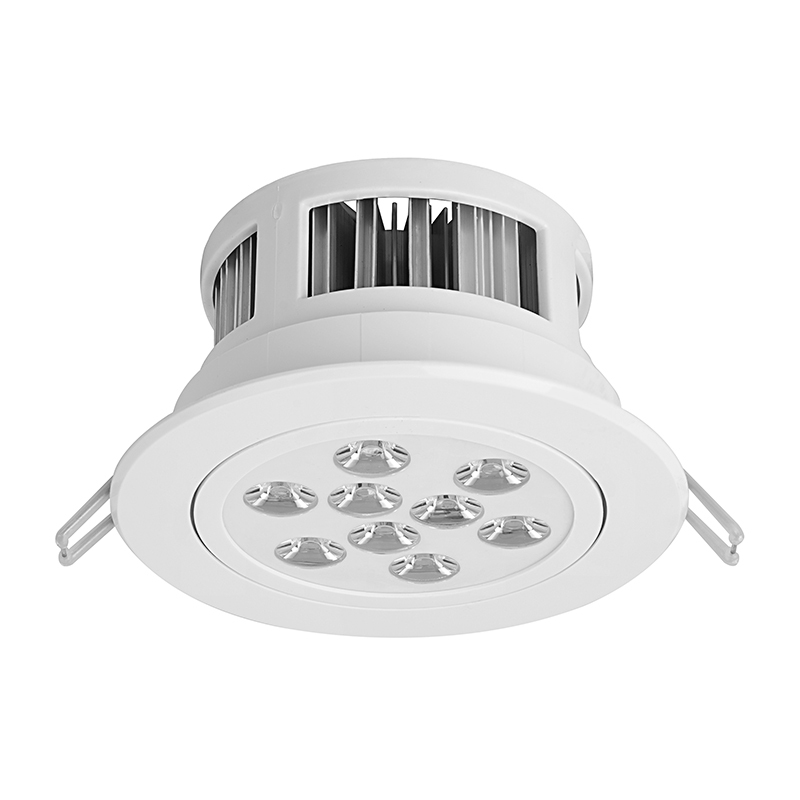 9 Watt LED Recessed Light Fixture - Aimable and Dimmable: Showing Aimable Feature Of Fixture. 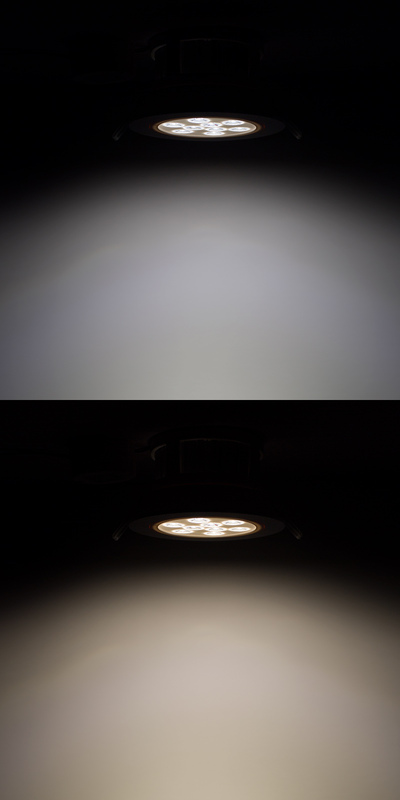 Aimable LED recessed lights are perfect for ceiling downlighting, living room lighting, basement lighting, closet lighting, bar lighting, and more. 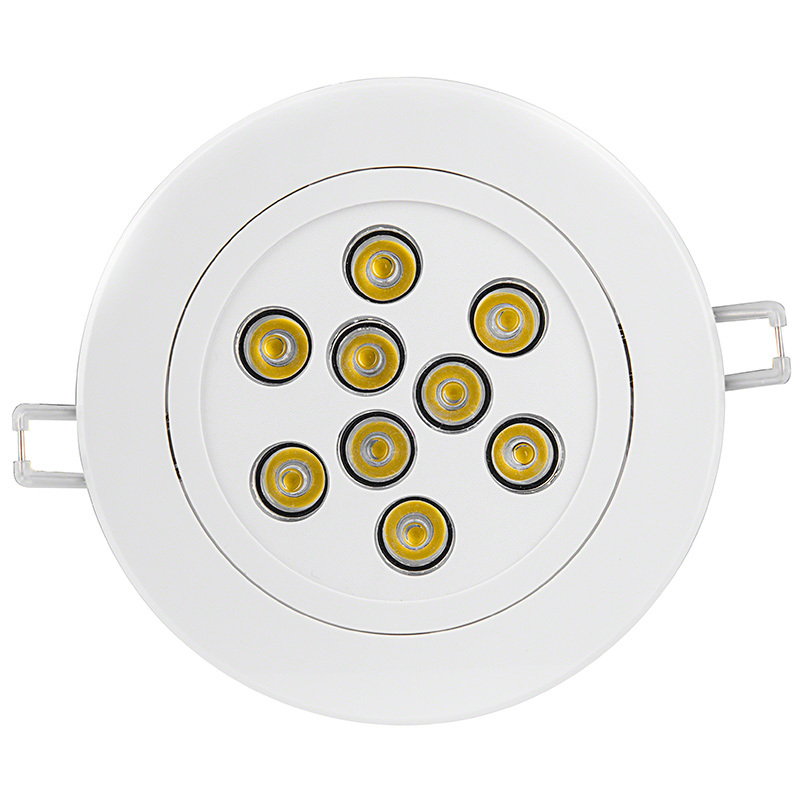 Using 9 LEDs, the recessed light emits up to 920 lumens of natural white or warm white illumination. 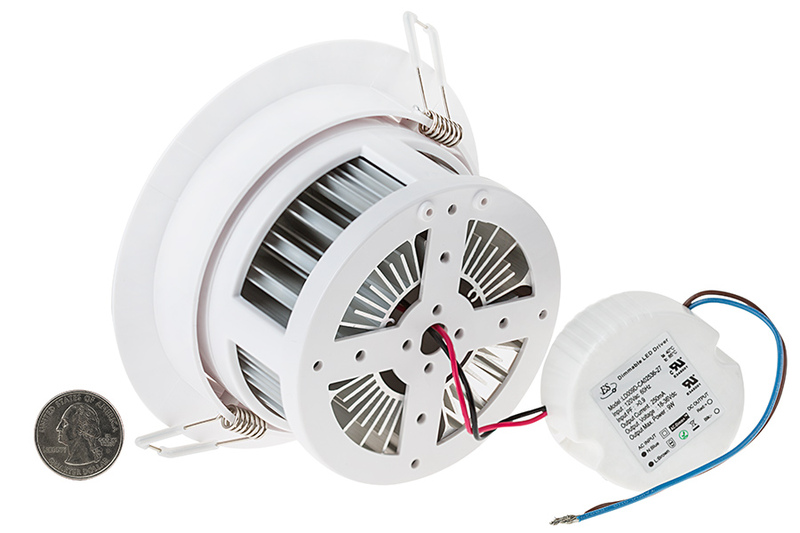 This LED recessed light has a white housing with integral heat sink and an aimable light head with a polycarbonate lens. The light head pivots 10° to either side of its axis. 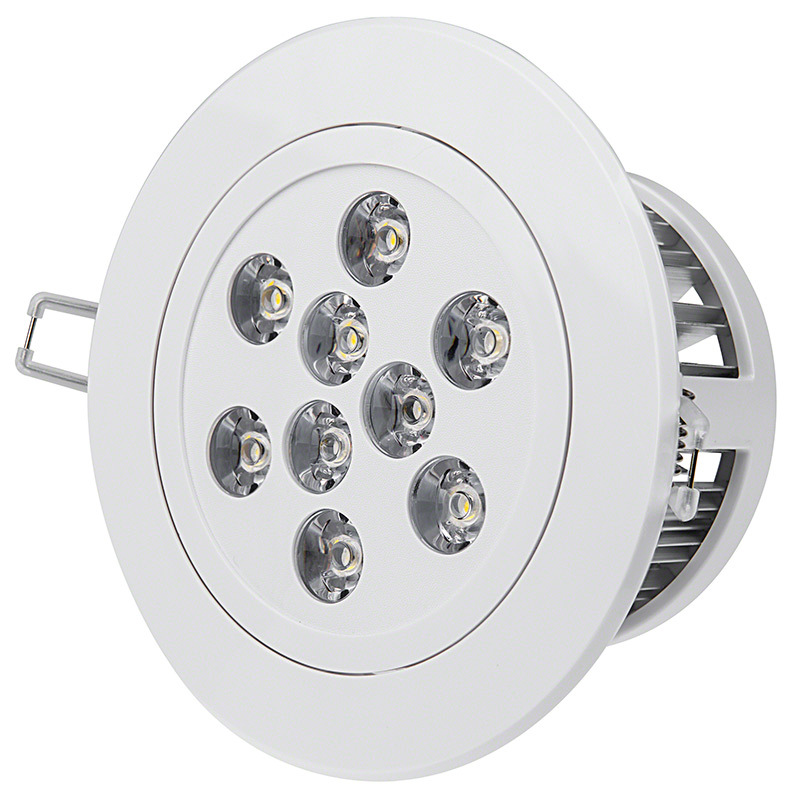 The 9-watt LED light typically consumes 12 total watts due to the combination of all internal components; an incandescent fixture with comparable output would consume 60 watts. A dimmable constant-current driver is included, and the fixture operates within a wide 95-140 VAC range. 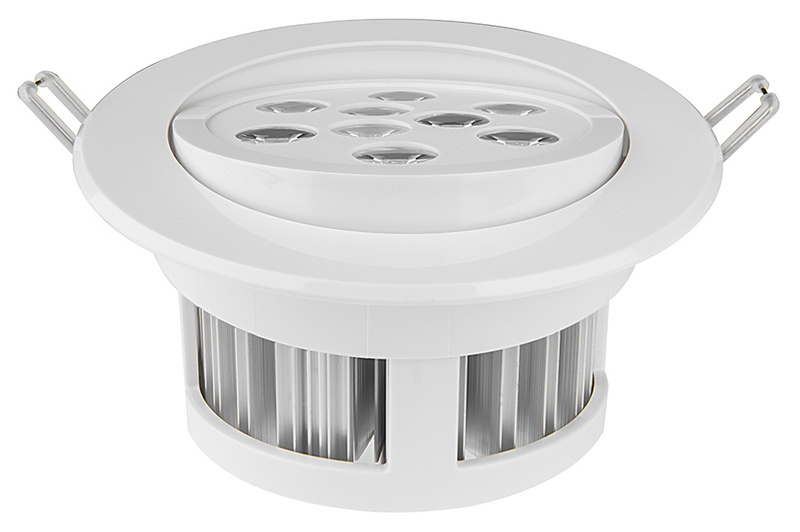 Easily flush mount the fixture in a 4-13/16" to 5-3/8" hole with attached retaining clips. I installed 6 of these lights in my family room. The install was easy and the cans hold tight to the drywall. Hole for the can needs to be 4 3/4 inches which you can do with a hole saw or a circle jig on a rotozip. Making the wire connections is a little bit problematic because of the short pigtails on the driver. The wires are 20 ga 6" long. You will need to install the light next to a box and make your connections in the box if the install is going to be inspected or you are picky about the code. The product would be better if the low voltage wires were 16" long and the driver had terminals for the high voltage connection. An integrated splice box would be even better. If you are like me, you will just make the splice connections inline and finish off with twist nuts and electrical tape. 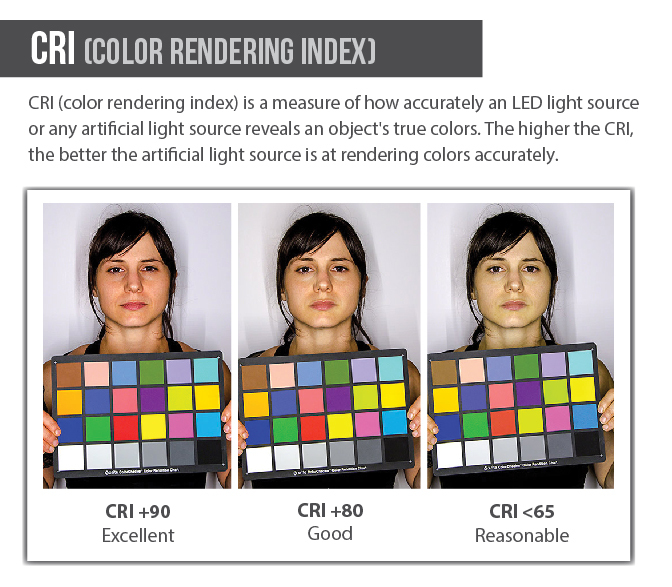 Light output is good, dimming feature is also nice because the light is too bright for watching TV. Plenty of light to read a book on full power. Use a LED compatable dimmer ($16). Use a hole saw on the end of a standard drill. Punch the hole, plug the fixture in and stick it through the hole. DONE! The firm little springs hold it in place. The only thing that is unique to each structure and locale, is how to make the 110V connection. In the Chicago area, most structures require that you run 110V wire in conduit. 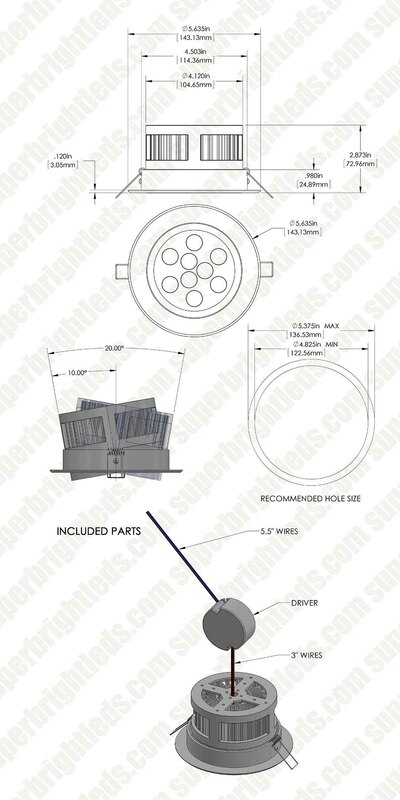 With these fixtures you have to wire in a two wire plug and simply plug into a a standard receptacle, that is connected via conduit. 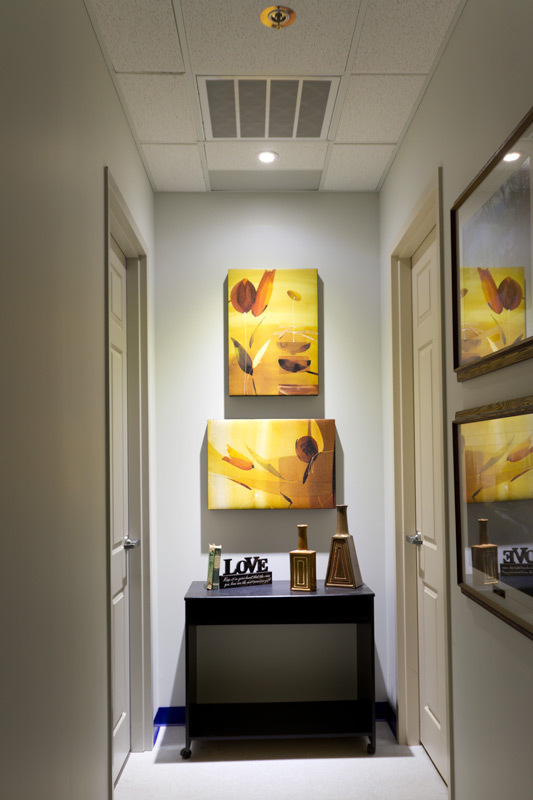 These make a ton of light and have a great spread for hallways and such. The only unusual thing with these is that when using an electronic dimmer switch, they dim to about 50% light output and simply turn off. They don't dim like a normal fixture. 1 out of 8 went bad within the first 2 months. the power supply is fine the led light will not work. It is proving to be a pain to get a warranty replacement on this. it has been out of stock for the last month and each week the website says it will arrive the following week. ugh i should have just went with led down fixtures from lowes. Thank you for your review of the RLFAD-NW9W-P45. Customer feed back is important to us. We apologize for the problems you are having with replacing your SBL product. Since replacement lights are now in stock, we are sending our the replacement product today. Great lighting anywhere you put them, highly recommend these light and this company...the customer service is excellent.